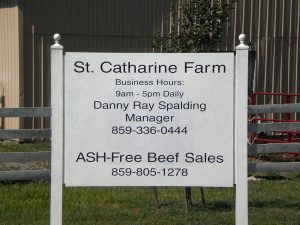 St. Catharine Farm was recognized as the 2018 Agriculture Achievement Award Winner at the Springfield-Washington County Chamber of Commerce Banquet on February 25, 2019. This Award recognizes an individual or business who has shown dedication to promoting agriculture in Washington County. Longtime friend, former Extension Agent, and current Advisory Council member Rick Greenwell presented the award to Farm Manager Danny Ray Spalding on behalf of St. Catharine Farm.